Tried many voice inputs of Babaji to match the fervor of Lord Ganesha, but they were either unclear or had too much of background disturbances, but you know what... Babaji gave an idea during the make and his voice was indeed able to be used and it has made complete justice to this song. Hope you enjoy it whole heartedly, for it was whole heartedly made for Babaji.... with Babaji... by Babaji :) Namah shivaya.. 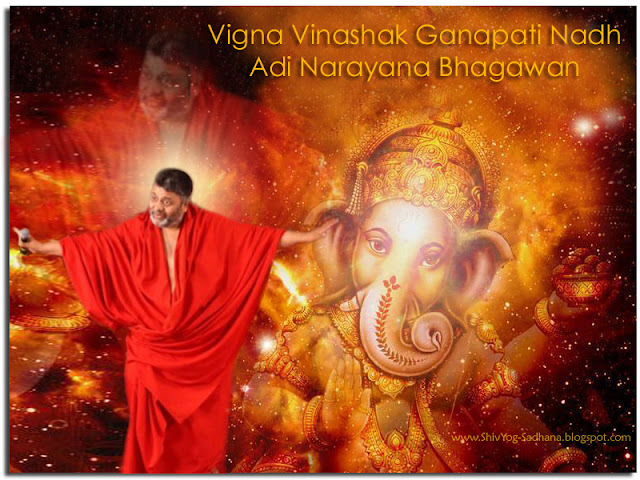 There are few notes on Ganesh Mantras/Slokas that you may find beneficial. One Mantra and One slokha has been used in the above song. The below entire info is taken from the different sources, the links of which are stated in the end of this article. Stay blessed. Namah shivaya. 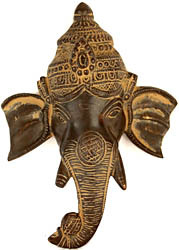 Ganesha mantras are siddhi mantras . Each mantra contains certain specific powers of Lord Ganesha. When chanted with the proper pranayama (rhythmic breathing) and sincere devotion, they will yield good results. In general, Ganesha mantras will ward off all evil and bless the devotee with abundance, prudence and success. Evil spirits dare not enter the home or the mind of the devotee where Ganesha mantras are recited. Those so mystically inclined and knowledgeable of the seven chakras below the muladhara use these powerful incantations under the direction of the guru to close off these regions of the mind one by one and free consciousness from deep depression, confusion, jealousy, rage, lingering anger and fear. Some such mantras are given below for the spiritual benefit of the readers. One more point to remember is that one should bathe or wash the limbs before sitting for repetition of the mantra. Also, one should do three or more pranayama before beginning the mantra. The minimum repetition of the mantra should be one full mala, or 108 times. When this is done at a fixed hour and place regularly for 48 days, it becomes an upasana, which means intense meditation, that will yield siddhis, or spiritual powers. Another warning to bear in mind is that one should use those powers only for healing the sick and other such selfless actions for the benefit of mankind. These powers should not be misused. Misuse of power may bring the curse of the asuras. This is a mantra from Ganapati Upanishad. One may always use it before beginning a journey, a new course in school, new career or job, or before entering into any new contract or business so that impediments are removed and your endeavor may be crowned with success. This mantra is usually taught to children for their good education. It increases their memory power, and they become successful in their examinations. Of course, people of any age may use this mantra when taking courses in a school or university, and for success in attaining their degree. This is a very powerful mantra, as discussed in the Ganesha Purana. When something is not working properly, individually or universally, nationally or internationally, or when the minds of the people turn crooked, negative, depressed or discouraged, the attention of Ganesha may be drawn by this mantra to straighten their ways. The HUM symbolizes "Delay no more, my Lord, in straightening the paths of the crooked-minded ones." This mantra is used many times in the Ganesha Purana to curb the atrocities of cruel demons. In addition, this mantra could also be used for healing any spinal deficiency, such as curvature of the spine or curved limbs. Dedicate 1,008 repetitions of this holy word to straighten and heal such deficiencies. Kshipra means instantaneous. If some danger or negative energy is coming your way and you don't know how to get rid of that trouble, with true devotion, practice this mantra for quick blessing and purification of one's aura. There are several bija (seed) mantras in this mantra . Among other things, it signals, "Shower Your blessings, O Lord. I offer my ego as an oblation." This mantra has a lot of meaning, but to make it simple, it means you will be always very beautiful in soul, in spirit, in face, everything. By meditating on this mantra, very pleasing manners and a beauty comes on you. Along with that comes peace, which constantly dances in your eyes; and the words you speak are all filled with that power of love. Ekadanta refers to one tusk in the elephant face, which means God broke the duality and made you to have a one-pointed mind. Whoever has that oneness of mind and single-minded devotion will achieve everything. Kapila (red) means that you are able to give color therapy. You are able to create colors around yourself and around others, bathe them in that color and heal them. As per the mantra you create, so will you create the colors. Another meaning is "wish cow," the "cow of plenty." It means that whatever you wish, that comes true. There is a wish-cow inside you. Whatever you wish, especially for healing others, comes true immediately. The ears of Ganesha, the elephant, are constant fanning, which means people may talk a lot, but you are not receiving inside anything other than that which is important. It also means that you can sit anywhere and tune this cosmic television (the body) with seven channels (chakras) and all 72,000 nadis, to any loka and be able to hear ancestors, angels, the voice of God or the voice of prophets. That kind of inner ear you will develop through this mantra. This means you feel that you are this universe. It means that all the universes are within you. Like an entire tree is in the seed, the whole universe is in the sound of creation, which is Aum, and that Aum consciousness in you makes you feel that you are the universe. Therefore, if you say, realizing the oneness with the universe, "shanti to the world" every day, then the grace of God will come and there will be world peace, universal peace. It is the universes within Aum and Aum within you. This means realizing this world as a dream or a drama. When you are in that high consciousness, this whole world looks like a dream. All of us have taken a role. We have to play our role in life as wife or husband or children or citizens, all consistent with the role we have taken. When an actor bitten by a sponge cobra that is brought on the stage falls, the entire audience cries; but that boy who has fallen knows it was not a real cobra and he is not dead. Life is a drama -- definitely life in this material world, this physical world of ego, is a drama. But inside, like the boy on the stage who is quite happy knowing that he didn't die by the bite of the sponge cobra, like that, the truth never dies in us; it is immortal. So everything else you consider as drama. That consciousness comes to you by knowing this mantra. This mantra invokes the Lord Ganesha to remove every impediment in your life and in your works. By constant meditation on this mantra, all obstacles and blocked energy in your physical and astral bodies are released. Vinayaka is the name of Ganesha in the golden age. So by realizing this mantra, your life will have a golden age. In your office, in your work, you'll be the boss. Vinayaka means something under control. Vinayaka means the Lord of problems. This mantra is so important. Suppose you have a group, a country, neighbors, or any kind of group therapy, group healing or a whole country needing healing, then you have to bring that entire group to your mind's arena and say this mantra. A group healing takes place by this mantra. In Sanskrit, bhala means the forehead center. Chandra means the crescent moon. Bhalachandra means that chakra from where the nectar drips. That is the secret of all healing. It is to feel yourself as Siva, identifying yourself with the Truth and feeling constantly that you are carrying the crescent moon, the symbol of growth and nectar and peace. 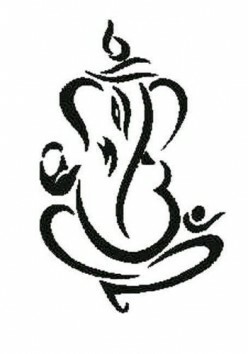 Meaning: We meditate on Lord Ganesha - who is clad in white (representing purity), who is all pervading (present everywhere), whose complexion is gray like that of ash (glowing with spiritual splendor), who has four arms, who has bright countenance (depicting inner calm and happiness) and who can destroy all obstacles (in our spiritual and worldly path). Meaning:The Lord with the curved trunk and a mighty body, who has the luster of a million suns, I pray to thee Oh Lord, to remove the obstacles from all the actions I intend to perform. Meaning:I worship day and night that elephant faced Lord Ganesha who is like sun to the lotus face of Mother Parvati. 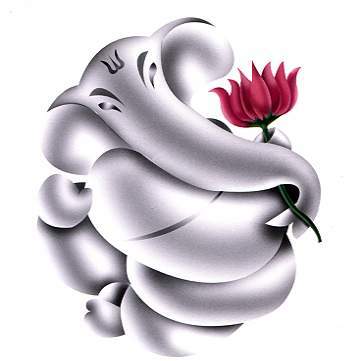 Giver of many boons, the single tusked Ganesh, I salute Thee to give e a boon. Meaning: We invite You, the Lord of spiritual faith (of Lord Shiva). You are the wisest among the wise, the best to be given as a standard of comparison. You are the senior Lord, Lord of the Vedic manthras, listening to our prayers. Please visit our home with prosperous things and be seated here. Meaning: We meditate on that super power, we invoke the single tusked boon giver, Ganesh. Meaning: I prostrate before Lord Vinaayaka who joyously holds modaka in His hand, who bestows salvation, who wears the moon as a crown in His head, who is the sole leader of those who lose themselves in the world. The leader of the leaderless who destroyed the elephant demon called Gajaasura and who quickly destroys the sins of those who bow down to Him, I worship such a Lord Ganesh. Meaning: I meditate eternally on Him, the Lord of the Ganas, who is frightening to those not devoted, who shines like the morning sun, to whom all the Gods and demons bow, who removes the great distress of His devotees and who is the best among the best. Meaning: I bow down with my whole mind to the shining Ganapati who brings happiness to all the worlds, who destroyed the demon Gajasura, who has a big belly, beautiful elephant face, who is immortal, who gives mercy, forgiveness and happiness to those who bow to Him and who bestows fame and a well disposed mind. 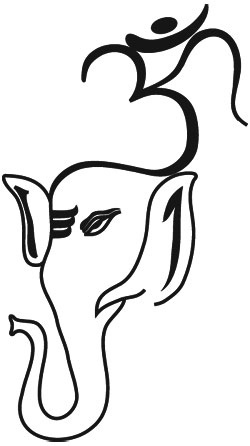 Meaning: I worship the ancient elephant God who destroys the pains of the poor, who is the abode of Aum, who is the first son of Lord Shiva (Shiva who is the destroyer of triple cities), who destroys the pride of the enemies of the Gods, who is frightening to look at during the time of world's destruction, who is fierce like an elephant in rut and who wears Dhananjaya and other serpents as his ornaments. Meaning: I constantly reflect upon that single tusked God only, whose lustrous tusk is very beautiful, who is the son of Lord Shiva, (Shiva, the God of destruction), whose form is immortal and unknowable, who tears asunder all obstacles, and who dwells forever in the hearts of the Yogis. Meaning: He who recites this every morning with devotion, these five gems about Lord Ganapati and who remembers in his heart the great Ganesha, will soon be endowed with a healthy life free of all blemishes, will attain learning, noble sons, a long life that is calm and pleasant and will be endowed with spiritual and material prosperity. Meaning:Every day, I bow down to that Lord, the son of Gowri, the Lord one who lives in the heart of the devotees, blessing them always with good health and prosperity. Meaning: Starting from here the twelve names of Ganesha are mentioned and he is worshipped in those different forms. The first as the Lord with the curved trunk; second, as the one with only one tusk, third, as the one with black (red/brown) eyes, fourth, as the one with giant structure. Meaning: Ninth, as the one with moon on the front of His head, tenth, as the foremost leader, eleventh, as the leader of the ganas, twelfth as the one with elephant face. Meaning: The various names and associated forms of God Ganesha are enumerated and need to be meditated upon here - the one with an auspicious face, the single tusked Lord, the one who is of red color, the one with the ears of an elephant, the one with a big stomach, the one with a jovial disposition, the controller of obstacles, the Lord of the Ganas. Meaning: Whoever the one who recites and listens to these sixteen names at the beginning of studies, at the time of marriage, while entering or departing a place, or at the battle field, all their obstacles will be removed. Even the Gods worship Lord Ganesha to receive the fulfillment of their actions. Oh Lord Ganesh, the One who has this power of destroying all the obstacles in the way of the devotees, I prostrate before you. Ganpati Bappa Moraya.... thanks Jacob Bhai.. you are realy Gem .. loved by Babaji .. Thank you Jacob.. You actually came like Baba's angel to me..